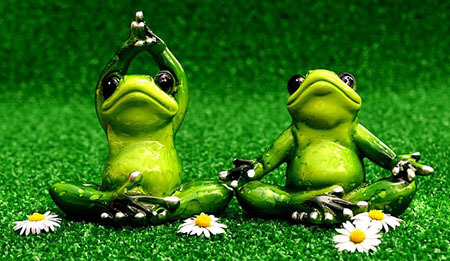 Yoga is a mind-body exercise that combines both active (moving) and passive (held) poses and stretches with specific breathing and relaxation techniques. Yoga exercises can be done individually or as a class. Yoga originated in India in the 6th or 5th centuries BCE as a meditative spiritual practice and philosophical discipline. Many styles or schools of yoga exist: hatha, iyengar, kundalini, bikram, etc. You will want to try different styles to see which one best meets your needs. Simple yoga exercises are a great way to calm your nerves from daily stress. Calm your nerves with relaxation exercises: http://www.everydayhealth.com/emotional-health/mini-relaxations.aspx?pos=1ξd=nl_EverydayHealthWomensHealth_20160810. Yoga can stretch and strengthen muscles, and may be used as part of recreational therapy following hospitalizations. Yoga can be part of an integrated therapeutic approach to chronic pain. It allows you to have more control over your response to pain, because it is an active therapy that you can use whenever it is needed. Integrative Approaches to Pain: http://www.mayoclinic.org/integrative-approaches-to-treating-pain/art-20208637?utm_source=newsletter&utm_medium=email&utm_campaign=pain-management. Beyond Opioids: Other options for treating chronic pain - http://www.everydayhealth.com/columns/health-answers/beyond-opioids-other-options-treating-chronic-pain/?xid=nl_EverydayHealthLivingWithChronicPain_20160908. Yoga can even help you sleep better! It is an effective relaxation exercise to try before bedtime. Remedies for sleep problems due to aging: http://www.everydayhealth.com/sleep/insomnia/tips/seniors-dont-take-sleep-woes-lying-down.aspx?pos=1ξd=nl_EverydayHealthWomensHealth_20160821. Your local library may have books or DVDs about yoga. You can find many articles and videos describing various yoga exercises online. Here are a few to get you started. As with all physical activities, please check with your healthcare professional to be sure you are ready to begin doing yoga.